KeraSoft® lenses by Bausch & Lomb are a groundbreaking innovative, patented designed contact lens for people with irregular corneas. KeraSoft IC addresses the unique challenges of people with a variety of irregular corneal conditions, including keratoconus as well as conditions due to post-graft and post-refractive surgery. KeraSoft IC lenses use a patented technology and geometries from complex mathematics to create a lens design that, delivered in a silicone hydrogel material, offers comfort and visual acuity for irregular cornea patients. With KeraSoft IC, we can confidently fit your eyes with a custom-made lens to meet your exact needs. If you have irregular corneas, KeraSoft IC is a new option that you have been waiting for! Irregular corneas can be caused by a number of reasons including disease, trauma, corneal transplants and complicated laser surgery. Such patients can have considerably reduced vision that is not adequately addressed by standard contact lenses. 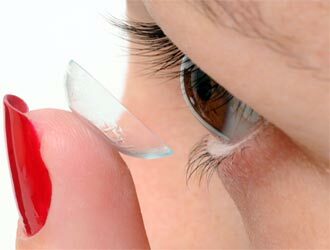 Standard contact lenses and eyeglasses do not successfully address the complexities of an eye with an irregular cornea or keratoconus. Traditionally, patients with irregular corneas have been limited to gas permeable lenses which resulted in reduced wearing time for some patients. With proprietary Sector Management Control, up to two sectors of the lens periphery can be modified independently. This allows the lens to conform to the shape of any cornea, which is particularly helpful when fitting keratoconic eyes as the disease advances.